Leg Day is the hardest training day for all bodybuilders – mostly because legs are difficult to build up compared to the rest of the body. 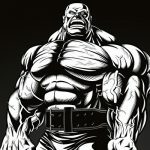 Weak legs for a professional bodybuilder is like kryptonite – it can destroy the entire career. The 2018 Olympia is just days away, the champions of each division are working hard to defend their titles and the challengers looking to usurp them in hopes of claiming their own glory. Flex Lewis is one of those reigning champions prepares himself to defend his 212 Olympia title for the final time before (likely) moving on to the open bodybuilding. Flex is putting all his energies into bringing his best form to stage yet. But he’s not doing so alone. Alongside the champ is Open Weight contender Frank McGrath hit legs session at the famous Dragon’s Lair gym. This is Not your typical leg day, this one is very controlled, really emphasizing the mind + muscle connection. Flex had designed and taken on this new program of time under tension leg day style these last few weeks for his Olympia prep, after years of issues with lower back pain, and knee issues this new style has not only stimulated new muscle tissue but eliminated the lower back pain. Flex Lewis and Frank McGrath hit insanely brutal leg day, it’s hard, it’s heavy it’s unfiltered. Check out the above video!